Many sailors cruising the Intracoastal Waterway know Oriental as the halfway point between New York and Florida. The village used to be a sleepy fishing community with a tiny harbor and excellent marine services, but few amenities. All that has changed. “The Sailing Capital of North Carolina” still has just 875 residents, but more than 2,700 yachts reside in marinas or at private docks on the many creeks that wind through and around the village. “Oriental’s been discovered,” agrees Steve Williams, a partner in Oriental Harbor Marina, which opened downtown last fall. Some say that marina not only contributed to change but sets the standard for future development. Williams, George Dobson and Bill Burns created the 120-slip marina, moved the abandoned 1912 train station and renovated it into shops and restaurants, created a waterfront park, and built three townhouses on the site. Oriental does seem to be in a bit of a time warp. People wave and have time to chat, and tall trees shade spacious lawns. Docks extend into creeks behind homes, and a town park stretches four blocks along the Neuse River, providing vistas across five miles of water often dotted with sails. Cooling breezes waft off the water at the sandy town beach. Most of Oriental’s many marine-related shops and services cluster near or along downtown’s four-block waterfront, from Oriental Harbor Marina to the mouth of Raccoon Creek, the commercial harbor where the shrimp fleet docks. Among the businesses you’ll find are the Oriental Marina and Inn; charts, nautical gear, hardware, clothing, and kayak and bike rentals at Inland Waterway Provision Company; used books at Hodge-Podge Books; canvas work at Downeast Canvas; kayak sales and rentals at Pamlico Paddle; casually elegant clothing at Martha’s Cottage; retail seafood at Fulcher’s (one of two local seafood companies); and fine wines and beer at The General Store, as well as two sailmakers, sailing associations and yacht clubs. Within walking or bicycling distance along Broad Street — the main drag — you’ll find the county cultural center, art gallery, bakery, health foods, well-stocked grocery store, weekly farmers’ market, post office, barber and beauty shops, bank, hardware store, and medical center.Offices of yacht brokers, sailing schools and real estate agents dot the village. While exploring you’ll likely spot funky Adirondack chairs here and there, some decorated with boats, pineapples or sea creatures, others shaped like lobsters, fish or tropical maidens. Bob Werner and his wife design and build the chairs in their South Water Street shop. Most restaurants are within three blocks of the marinas. Choices range from down-home cooking to gourmet dining. Boaters congregate at Coastal Corner Deli’s outdoor tables at Oriental Harbor Marina, next door at the Harbor Club, and at The Bean gourmet coffee shop and ice cream parlor, which overlooks the commercial harbor. At M&M’s Café, you’ll probably have to wait in line with locals, boaters and others who arrive in luxury automobiles, but the cuisine is worth it. Oriental Steamer Restaurant features fresh fish, as does Oriental Marina’s new Toucan Grill and Fresh Bar. On Broad Street, locals pack Mrs. Sil’s Kitchen. Scoot’s serves much more than pizza, including superb wrap sandwiches. A few bed-and-breakfast inns, two waterfront motels, and Oriental Harbor Marina’s townhouses offer lodgings on or near the harbor. Sailing, cruising, racing, sportfishing and gamming about boats are primary daytime pursuits. After 6 p.m. on weeknights Oriental is fairly quiet, the sounds of water lapping and seagulls providing the only soundtrack. More visitors make summer and weekends livelier, with club meetings, singalongs, festivals and community theater performances. For real action, however, you have to go to New Bern, the county seat 25 miles away. Most folks like it that way. The town still has the feel of the old days, when commercial fishing was the village’s economic engine, and “setting and rocking” were a major pastime. The Parkers are living on their 32- foot Fales Navigator motorsailer, which they sailed to Oriental from Massachusetts, while their home was being built. (Last year they found the boat and the building lot with a dock through Soundings.) They epitomize the wave of cruisers dropping anchor permanently in Oriental. Oriental, N.C., is on the Intracoastal Waterway (Neuse River) at the head of Pamlico Sound, about halfway between New York and Florida. The village proper occupies the peninsula bounded on the north by Whittaker Creek; on the south by the confluence of Greens, Kershaw, Smith, Camp and Raccoon creeks; and on the east by the Neuse River. 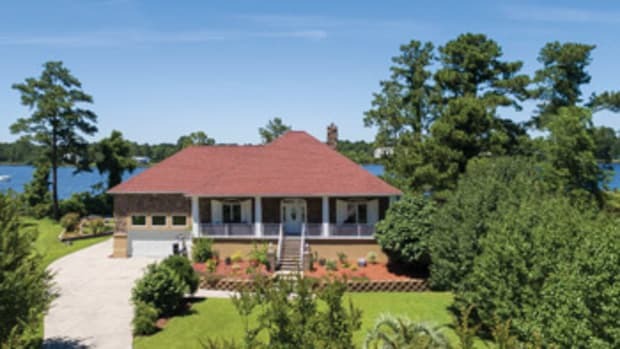 This “Sailing Capital of North Carolina” boasts myriad marine services including marinas, boatyards offering full repairs, sailmakers, canvas workers, chandleries, provisioners, storage, delivery, yacht sales, yacht clubs. A lighted rock jetty protects the downtown harbor (Raccoon Creek) where fuel is available at Oriental Marina & Inn, near the head, (252) 249-1818, www.orientalmarina.com. The marina has several slips for boats to 80 feet (6-foot draft) for $1.25 a foot per night. Ice, showers, laundry, wireless Internet, swimming pool, tiki bar, restaurant and lodgings are on site. At the head of the small harbor, several boats can tie up at the town dock in almost 5-foot depths for up to 48 hours at no charge (no facilities). The harbor also is home to the commercial fishing fleet and Oriental Yacht Club (no facilities). Oriental Harbor Village Center and Marina, (252) 249-3783, www.orientalharbor.com, opened last fall two blocks west of the commercial harbor, just east of the Route 55 bridge over Smith Creek. It offers deep-water slips and dockage for boats to 75 feet for $1.25 a foot per night. Amenities in the waterfront park setting include slips with all utilities and Internet access, free pumpout, showers, laundry and temporary membership in the adjacent Harbor Club (the former Trawl Door Restaurant). Shoreside, the marina’s general store — beer, fine wines, provisions and souvenirs — and Coastal Corner Deli, with harborfront deck and seating, occupy the remodeled 1912 train station. The complex also includes gift shops, a sailing school, yacht brokers and three rental townhouses. West of the Route 55 bridge, on Camp Creek next to the public launch ramp, Clancy’s Marina and Marine Mechanical offers mechanical and electrical repairs, and may have transient dockage, (252) 249-2925. About a mile north of the working harbor on the south bank of Whittaker Creek are Deaton Yacht Services, (252) 249-1180, and Sailcraft Service, (252) 249-0522, both of which have 25-ton Travelifts and do full repairs. Deaton’s may have transient slips. Across the creek, Whittaker Creek Yacht Harbor, (252) 249-1020, www.whittakercreek.com, offers dockage for boats to 120 feet in 8-foot depths, with fuel, pumpout, full repairs and amenities, including a swimming pool. The marina’s courtesy car is necessary, since the facility is about three miles from downtown. Anchoring is allowed in the harbor, downstream of the bridge (where 50 boats may gather in-season) or tucked into Smith or Greens creeks. Depths run 6 to 8 feet in the harbor, less elsewhere. There is a public dinghy dock adjacent to Oriental Harbor Marina. Oriental has minimal lunar tides, but strong winds can affect depths by 2 or 3 feet. NOAA chart 11552, Neuse River and upper part of Bay River, covers Oriental and approaches. Chart 11541, Intracoastal Waterway, Neuse River to Myrtle Grove Sound, covers Oriental and the ICW to the north. • Dec. 10-12 — Spirit of Christmas, with afternoon Christmas parade, evening luminaria along Broad Street, merchant open houses, (252) 249-0555. • Dec. 31 — Dragon Run. A 50-foot dragon, powered by children and adults beneath its flowing canopy, winds through the streets to welcome in the New Year, (252) 249-0555. • Late April — Oriental Harbor Boat Show, (252) 249-3783. • July Fourth weekend — Croaker Festival, hometown fair that honors the fish that “croaks” when it’s caught, (252) 249-0555. • July (last week) — Tarpon Tournament, (252) 249-0555. • mid-September — Oriental Cup Regatta and Boat Show, (252) 249-0555. • Fall — Non-Football Regatta, go sailing instead of watching television, (252) 249-0960. Great boating inside the Outer Banks — that’s what Oriental is all about and has been ever since its founding by a shipwrecked fisherman in the 1880s. One river and seven creeks meander through and around the village, so almost everyone works or plays on the water. Oriental even takes its name from a ship — not a place — though you’ll see Far Eaststyle dragons in local logos. In 1886 Becky Midyette, wife of Oriental’s founder and first postmaster, selected the name, recalling a ship’s sternboard that had washed up on a Roanoke Island beach. The sternboard belonged to the Union transport ship Oriental, a victim of the Tar Heel State’s notorious Cape Hatteras in 1862. Fishing the productive creeks and Pamlico Sound created Oriental’s economy. Later, steamships and railroads profitably carried local agricultural products and lumber. Most downtown buildings date to the early 1900s, when lumber was king and Oriental boasted boarding houses, cotton gins, an ice plant, oyster cannery, tile plant, livery stables and shops of all sorts. The village had the first electric light company in Pamlico County and the first motorized school bus in North Carolina. One of the more prestigious houses in town belonged to the superintendent of the John L. Roper Lumber Mill. New owners have superbly renovated it. Fire destroyed the Roper Mill in 1913, then the Great Depression and a series of hurricanes devastated the village. Refrigerated trucks replaced the railroad, and most residents left before trains stopped running in the 1950s. The seafood industry remains, harvesting shrimp, fish, crabs and oysters. Two seafood processing plants operate downtown. Intracoastal Waterway cruisers began discovering this sleepy fishing village with excellent marine services in the late 1980s. Increasingly, boaters are moving here, drawn by the friendliness, yearround sailing and proximity to other coastal North Carolina locales. Local sailors mention several popular cruises. It’s about a four-hour sail up the Neuse River to New Bern (the county seat with marinas, restaurants, shops and attractions), eight hours east across Pamlico Sound to Ocracoke Island, eight hours north to Belhaven (and River Forest Inn’s legendary dinners), four hours down the ICW to busy Beaufort and its Atlantic inlet (where ICW and ocean cruisers congregate), and seven hours to Cape Lookout’s quiet anchorage. A powerboat, of course, will take significant time off those estimates.The Oriental Yacht Club — at a former crab dock — and other organizations sponsor lessons, regattas and races, including the Neuse Sailing Association’s mid-April clinic, the Oriental Cup in mid-September, and the Neuse River Solo Race in mid- October. Informal contests also spring up between friends just out for a sail. Others tout the local inshore and offshore fishing. Tarpon weighing more than 100 pounds — and the $4,500 first prize — are the quarry in the Rotary Club’s annual Tarpon Tournament. The myriad creeks attract gunkholers with smooth water, pristine wilderness and intriguing wildlife. Local shops rent kayaks and offer instruction. Almost a dozen real estate agencies in the village have been promoting Oriental to cruisers for decades. Land and house values in the area are skyrocketing, and subdivisions are springing up on the surrounding creeks, creating suburbs where most homes have private deep-water docks. Marinas that once served local fishermen have been upgraded to serve recreational boaters, and first-class marinas also have been built. New residents call Oriental “a state of mind,” a place reminiscent of 1950s childhoods, with the bonus of deep-water dockage, superb sailing and camaraderie with other boaters.